other than your own contradictory thought to what you want. Abraham discusses the Alcoholics Anonymous 12-Step Program, the effectiveness of modern medicine, water purification, soul mates, legalizing hemp and, what was removed from both “Think & Grow Rich” and “The Secret”. Over 3 1/2 hours of material from a 2007 Los Angeles Art of Allowing workshop. A Jerry Hicks top-choice pick! “I’ve always wanted to write a book. Is it OK for me to be relaying your message only?” Abraham relates the story behind Lynn Grabhorn’s “Excuse Me, Your Life is Waiting”. AND Abraham is asked about becoming a “blended being”. Abraham discusses water quality concerns. First, an examination of the word “medicine”. Next, a question on Napoleon Hill, leading to a discussion on what was edited out of both “Think & Grow Rich” and “The Secret”. And finally, examining the “upstream nature” of his crusade to legalise hemp. He’s been ”clean & sober” for 6 years, mostly due to Alcoholics Anonymous. Abraham takes us step-by-step through “The 12 Step Program”. “I’ve been trying a lot of career things, but not really finding a burning desire for any of them.” AND he’s in a bit of a hurry for success because he wants to help out his parents and underprivileged kids. He feels like his “relationship escrow” is long overdo and he’s tired of the struggle. AND “Telling it like it is” versus “Telling it like you want it to be. “I find myself in a situation where I answered the call of revenge.” Abraham discusses “the life-giving fresh breath of air” that revenge can give you when you are feeling powerless. AND a discussion on what “leadership” really means. The best thus far! 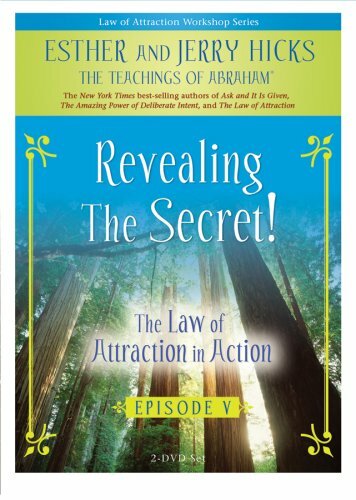 I own all of Abraham’s workshops and this one really really brings the viewer into their own flow & knowing! So many areas are covered, so many questions answered that you come away from this experience uplifted and validated in your own inner guidance which leads one to wanting to view it over & over.. I truly love all of the Abraham DVDs, but this is my personal favorite. THIS IS A MUST HAVE DVD. You will NOT be disappointed. I guarantee it. …Recently I find myself watching Episodes 2 through 6 over and over. They are fabulous, fabulous, fabulous! 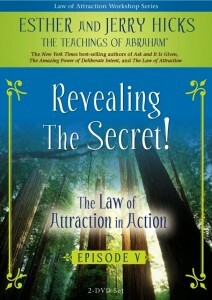 The Episode Series appears to be the best of the best of Abraham-Hicks. It is almost as good as having someone who adores me. For Esther and Jerry Hicks, life is all about having fun. That’s why their workshops are filled with joy and laughter, along with deep insights from Abraham – “teacher of teachers” from the non-physical realm. CDs, DVDs, cruises and workshops all feature Abraham’s wisdom, brought forth through questions and concerns from everyday people.